Shaker Square is neither located in Shaker Heights nor shaped like a square, but ask for directions to the coffee shop at "Cleveland Octagon" and you'll most likely receive only confused looks in return. 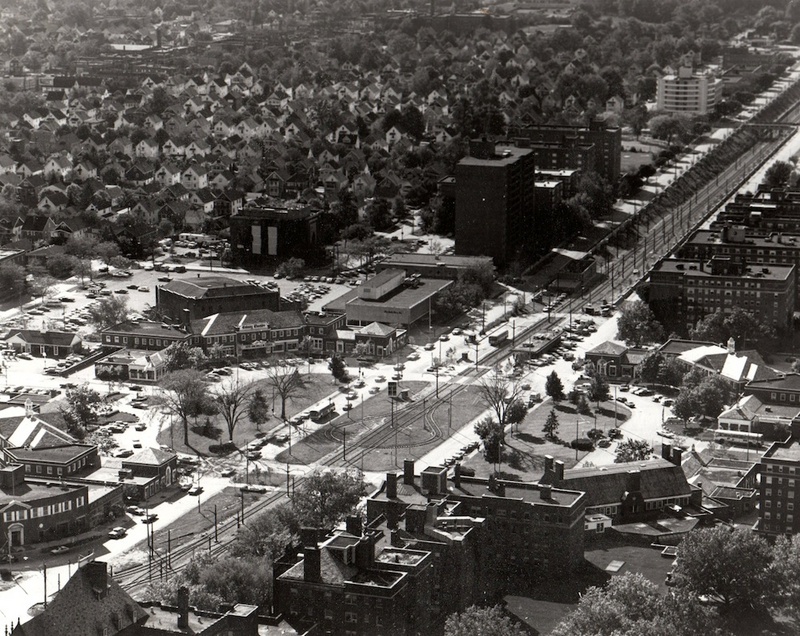 Shaker Square has always been shaped like an octagon. The original plan did not leave enough room for automobile parking, necessitating the adjustment, but the name remained the same. 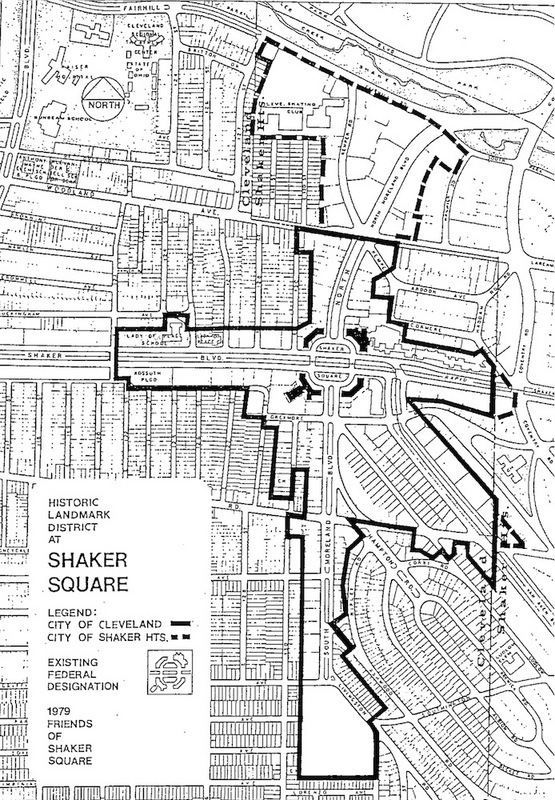 And Shaker Square is indeed located in the city of Cleveland, just west of its border with Shaker Heights. Strict zoning regulations originally prohibited the construction of apartment complexes and commercial buildings in Shaker. 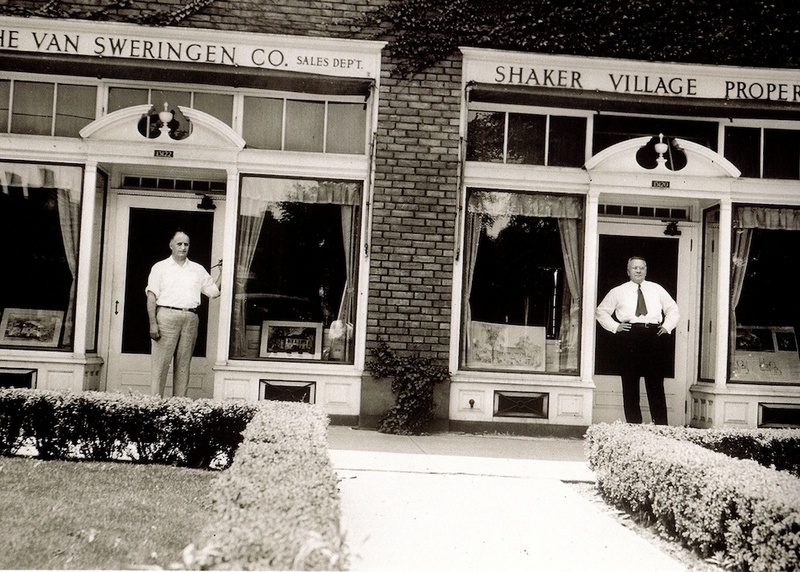 Thus, the dense residential neighborhood and bustling shopping center the Van Sweringen brothers developed would serve as a gateway to Shaker Heights, but remain apart from it. The origins of Shaker Square date to 1922, when real estate developer Josiah Kirby purchased land along Shaker Boulevard from the Van Sweringens. Kirby began building the upscale Moreland Courts apartment complex and planned to build shops and more apartments, but he soon went bankrupt. 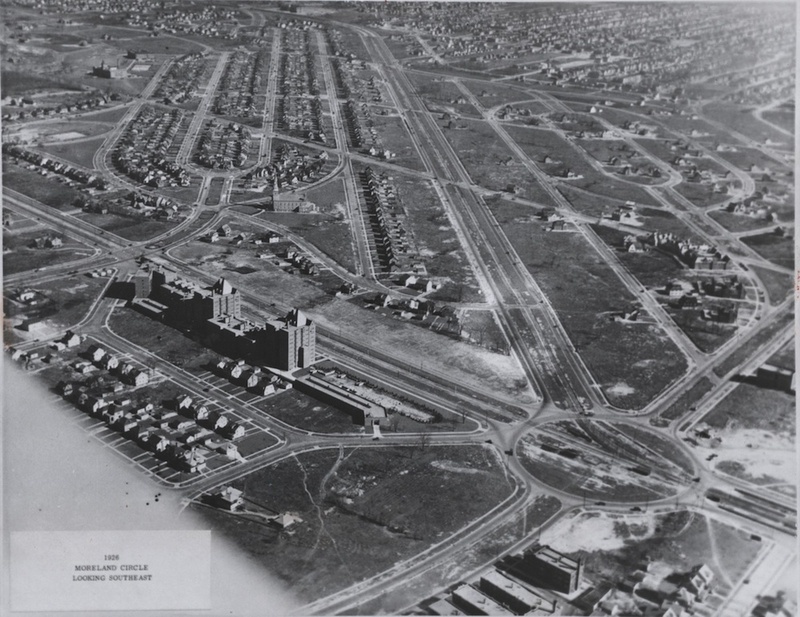 The Van Sweringens subsequently reacquired the land and planned a retail development of their own, as well as a high-density residential neighborhood and the completion of the Moreland Courts. Architect Philip Small -- a favorite of the Vans who also designed their Daisy Hill estate and a series of Demonstration Homes on South Woodland Boulevard -- designed Shaker Square with four buildings set around a "village green" which the Shaker Rapid ran through. Each building featured a two-story center section flanked on either side by a one-story wing. Small designed the buildings in the Georgian Revival style with red brick exteriors, white trim, and slate roofs. 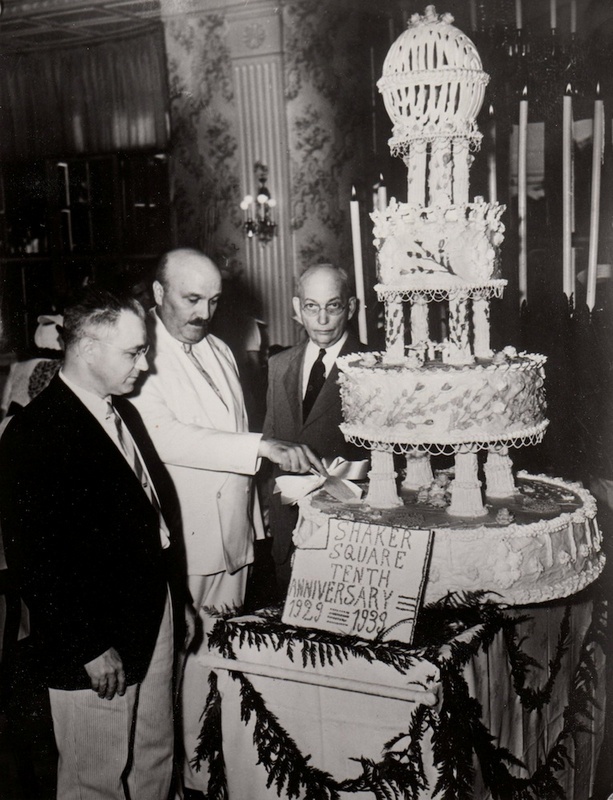 After more than two years of construction, Shaker Square opened in 1929. 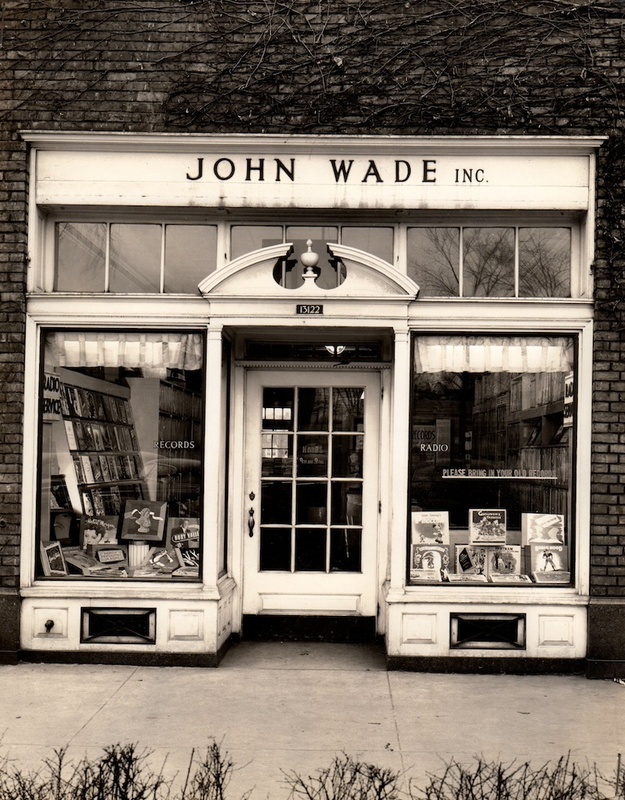 It contained a variety of high-end shops, restaurants, and professional offices. 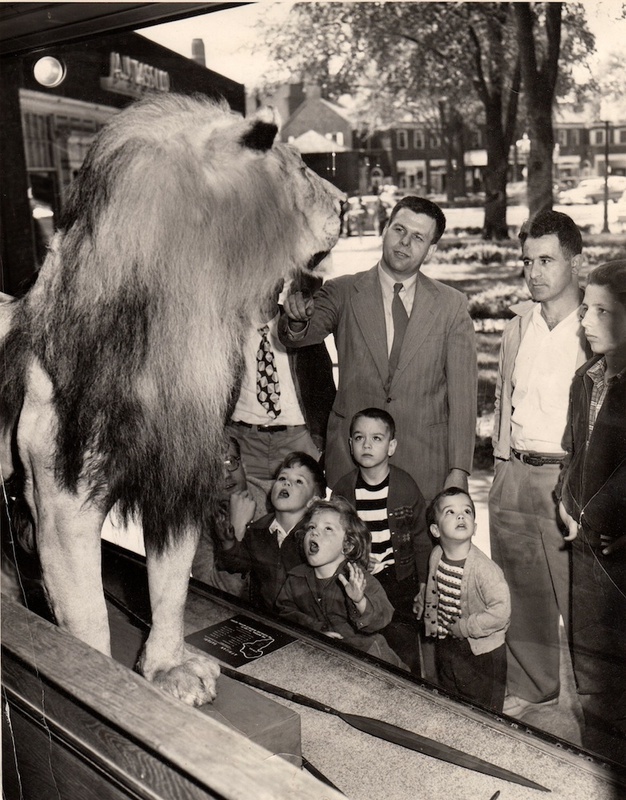 In addition, the Colony Theater opened on the Square in 1937. The Shaker Square Historic District became a Shaker Heights Landmark in 1980 and was added to the National Register of Historic Places in 1983. It contains 106 buildings, 72% of which were built between 1920 and 1932. Besides the four commercial buildings that make up the Square, the historic district contains mainly apartment buildings, as well as some duplexes and single-family homes on Ludlow Road. Since the construction of Shaker Square, Shaker Heights' zoning restrictions have been eased to allow apartments and shops in a number of areas. Shaker Square, however, remains a popular shopping and dining destination, and the apartment buildings that surround it continue to attract residents. 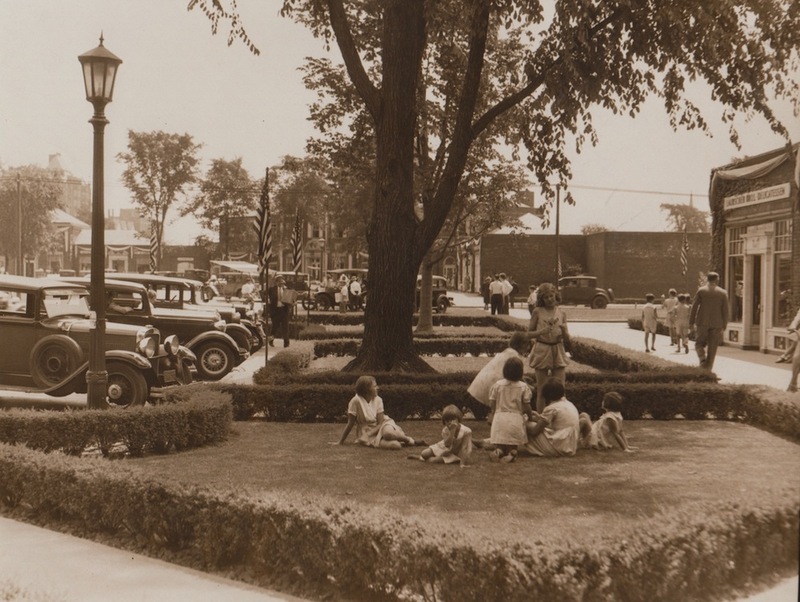 Shaker Square, 1938: Children sit on a lawn in the northwest quadrant of Shaker Square in 1938. Image Courtesy of Cleveland State University. Michael Schwartz Library. Division of Special Collections. Cleveland Press Collection. 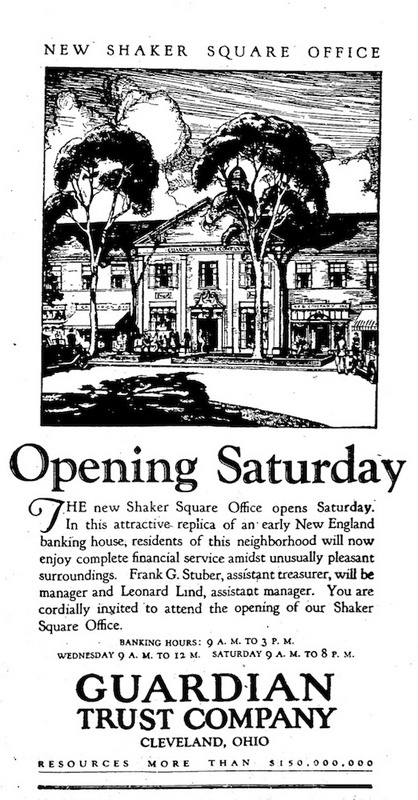 Guardian Trust, 1929: A 1929 newspaper advertisement for the new Guardian Trust bank branch at Shaker Square describes it as an "attractive replica of an early New England banking house." Other businesses located at Shaker Square during its early years included the Helen and Gertrude's Beauty Shop -- which promised "Scientific Care of the Hair and Scalp," Marshall's Drug Store, Mielziner Furs, Bunce Brother's men's clothing store, and a photography studio offering "Camera Portraits by Anthony Weins." Image Courtesy of Cleveland State University. Michael Schwartz Library. Division of Special Collections. 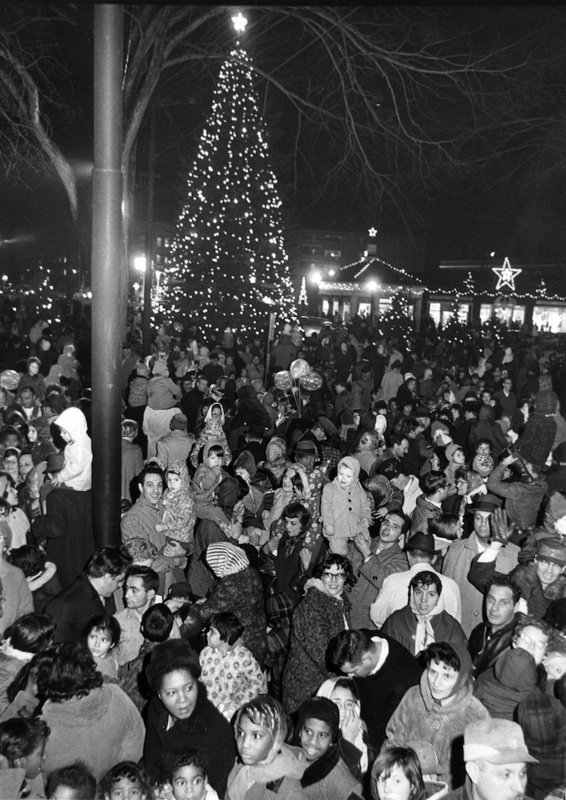 Christmas Tree Lighting, 1965: The annual Christmas tree lighting ceremony at Shaker Square always attracts a large crowd. Image Courtesy of Cleveland State University. Michael Schwartz Library. Division of Special Collections. Cleveland Press Collection. Kathleen Crowther remembers going to Shaker Square as a child. 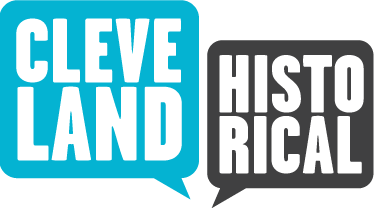 Michael Rotman, “Shaker Square Historic District,” Cleveland Historical, accessed April 18, 2019, https://clevelandhistorical.org/items/show/428.